Strategic decision making is one of those abstract, yet insanely important aspects of the business that every CEO needs to take into account. The abstractness of the term comes from the fact that different leaders perceive strategic decisions differently, much like different businesses have different business strategies. 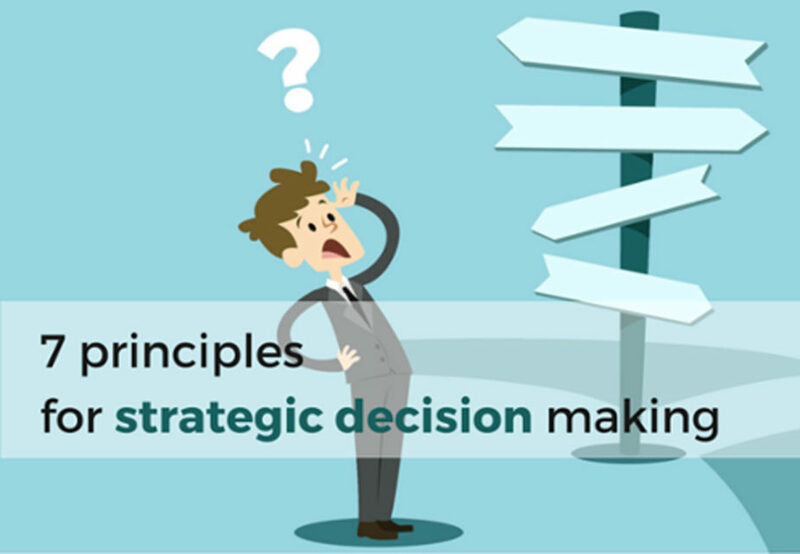 By definition, strategic decision making is an ongoing process that involves crafting strategies to achieve goals and altering strategies based on reviewed outcomes. While we all agree that strategic decisions vary from business to business, there are a number of common terms, or you could say, effective methods to influence and improve the process. Among those, probably the most notable, positive boosts to strategic decision making is experience. In his article published on entrepreneur.com Joel Trammel, CEO of Khorus, shares his methods of how his company handles those processes, and clearly mentions that all of those methods were shaped with the help of experience and trial and error. There is a saying that goes “Learn from the mistakes of others. You can never live long enough to make them all yourself”. This is by far the best thing that you can do as a smart CEO, who understands the risks and the weight of decisions that you take, and how they impact the future of your organization. Don’t do it alone – you might think that carrying all the weight on your shoulders will make others more comfortable, but that’s a lie. In fact, it’s one of the major signs of inexperience when you don’t involve others. No empire (or business for that matter) was able to stand tall for long having just a single person ruling it. If your team members have the expertise and authority to carry out decisions, encourage them to do so. The most important managerial skill – Trust your people. Don’t be tricked into thinking that just because you are the CEO, you know more about every topic. As Bryan Goldberg put it, if you have hired well, your team members will be much smarter than you in their area of expertise, so their decisions will be better shaped around certain topics. Communicate clearly – If you are making a decision as a group, then you need to make sure that the whole groups understands the reasoning behind the decision. As a responsible CEO, it’s your job to always communicate the “what” and “why” clearly and openly. You don’t want people to find out about your decisions from other sources and your reasoning has to always be clear to all involved parties. Experience and time have proven that it’s not just up to the CEO to make a business successful. In his article published on Forbes, Josh Bersin points out that regardless of who the CEO is, all business decisions are carried out by mid-level personnel and high level supervisors. When all of those positions are occupied by the correct people, the organization thrives. Probably the most important takeaway is that oftentimes, when you hear about an organization doing a spectacular job, the CEO receives all the credit for the success. However, in most (if not all) cases, the CEO is not the mastermind behind every smart decision that led the company to success: it’s a combined effort. The strength of the CEO lies in the ability to lead and shape the company culture in a way that encourages and promotes smart, creative and innovative people to take action, implement their ideas and utilize their combined expertise in order to come up with the best strategies possible. As much as experience is your best friend in strategic decision making, it’s not going to help you if you don’t learn from your own mistakes. In the rapid business world of today, leaders are forced to make fast decisions, often on the fly, which can lead to numerous problems in case the decisions are wrong. To counter this issue, whatever you do – testing, cultural change, implementing new policies, product feature changes, etc. – make sure every decision is flexible, adjustable and informal. This method will help leave less room for potential mistakes and give you the chance to avert everything if necessary. A survey of 1000 employees conducted by Brandfog, revealed that 75% U.S. employees agree that even when CEOs participate in social media activities and talk to people, it improves their leadership skills. And we all know that social media, in business terms, is mostly about listening to others’ opinion. Understanding whether your decision was good depends on others. You want to gather feedback and analyze it, but you need to be careful not to listen to everybody at once. People are very egocentric by nature and it’s not uncommon for them to refer to something as being “bad”, simply because your decision made them work 5% more than before. The majority of people will often disregard long term success just to be comfortable today. This is why you need to pick people who have no immediate agenda with the decision at hand, and listen to them. Also, keep in mind that whatever you do, mistakes will be inevitable. The only way to avoid mistakes is to make no decisions at all, but that approach will only lead to ruin. Instead, try to turn making mistakes into a learning process. As Bill Gates said “Success is a lousy teacher. It seduces smart people into thinking they can’t lose”. 1. No person can effectively leave his or her biases completely out: they all have lived through different experiences in life and came to understand and trust their experience around a certain topic. Asking people to be completely unbiased will result in nothing other than frustration and dissatisfaction before even the decision gets implemented. 2. Experience based biases aren’t shaped out of the blue: people have been through similar situations and that’s how they came to one or another conclusion. More often than not, those biases will do a better job than common industry best practices. One of the most cherished leaders in the world, John Kennedy, had a similar tactic when trying to make complex decisions. He would gather smart, educated and creative people who had a lot of experience under their belts and throw a complex issue at them. As the discussion went forward, every person shared his or her view around the matter based on past experiences and that’s how every complex decision was made. Kennedy is known as one of the greatest leaders in the world, and if his strategic decision making method worked well for a whole country, I imagine it will do just as good for a small, medium or large enterprise. In order to make the right decision, a smart CEO needs to be able to balance with uncertainty. When you shut down a conversation just because you feel uncomfortable with the direction it’s going, it usually leads to a culture where the best ideas never get to be voiced, because well, what’s the point if you’re going to disregard them anyway. You might argue that this approach does work and you will be right. A very clear example of a leader’s approach that disregarded everything but his own views is Steve Jobs and Apple. However, Steve Jobs was an exceptional person who was incredibly talented in what he did: user experience and design. Unless you are absolutely sure (and ready to face the consequences as Jobs did throughout his career) that you know what needs to be done, a diversity of opinion needs to be welcomed, even if it comes from the lowest ranked employees. Randy Komisar, the coauthor of Getting to Plan B: Breaking Through to a Better Business Model, tells his story about how much the little voice can matter sometimes. Every great leader has strong and weak sides. The ability to harness the power of what you excel at, while making sure your weaknesses are covered is the key to success. This is why you need to welcome internal criticism inside your company – people who know when you are wrong and have the courage to confront you. This also requires the ability to be comfortable with confrontation and not letting pride get in the way, a skill that not everybody has, but can develop. It’s important to welcome diversity of thought, but it’s also important to be able to take a stop and listen carefully. Whenever you are confronted by solid arguments and meaningful feedback, you may want to consider changing your point of view. Strategic decisions born out of healthy confrontation are difficult to agree on and implement, but they are also much better. Probably one of the hardest and also important parts in leadership and strategic decision making is understanding when you need to eliminate something for the sake of the greater good. It could be a program you will need to stop, or an investment you might need to take out and reinvest in another country, or outsource a part of the business, which means losing some employees. Those decisions are the ones that are very often overlooked because it’s so hard to give them a proper evaluation. The most effective way to make this happen is with the help of zero-based budgeting. Zero-based budgeting is an approach to planning and decision making where all expenses must be justified for each new period. In other words, if any aspect of your business carries more cost than return for every new period, it needs to be “let go” for the sake of future opportunities, growth and development. The tricky part is to understand whether the compromise you make for the future is really worth it: you need to make sure that your decisions to cut down your workforce or reinvest elsewhere are backed with compelling arguments and solid numbers. I’m not proposing to take every risk you encounter, but sometimes, calculated risks are what you need to accelerate business growth and make a giant step forward to prosperity. As much as experience based bias is important in decision making, courage and gut are no less important in most cases. Strategic decision making is as much about yourself, as it is about everybody else. Remember that the best decisions are born out of confrontation, teamwork and combined expertise. Don’t try to carry all the burden yourself: you are surrounded by great minds and smart individuals, don’t let their knowledge go to waste.